Officer Helicopter Pilot? It's a phenomenal career. “Flying helicopters is incredibly exciting; nothing compares to it. The training is tough but knowing you’ve helped troops on the ground is really rewarding." As an officer pilot you'll learn how to fly and command military helicopters. You'll lead complex aviation missions and command small, close-knit teams of other officers and soldiers. You will learn everything you need to know about flying, from take-off and landing to formation flying at night. 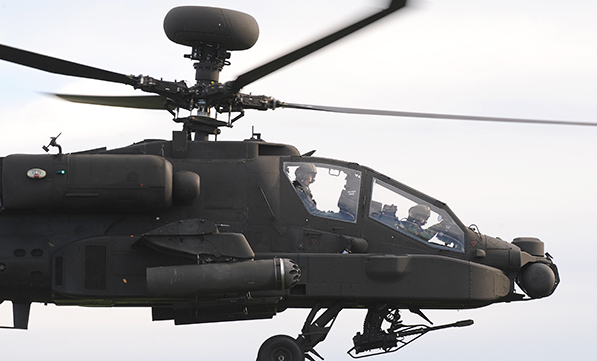 On completion of the Army Pilots' Course, if you qualify on either Wildcat or Apache, you will be eligible for a Foundation Degree in Military Aviation Studies. Fly the most advanced battlefield helicopters in the world. Provide essential support for troops on the ground. Have a huge impact on the battle, wherever you are. Attack targets, find the enemy, evacuate casualties and move troops and materiel. Get skills and a career for life. To become an officer pilot you must first and foremost apply to become a British Army Officer. You will complete standard Army Officer training at the Royal Military Academy Sandhurst. On passing the aviation aptitude, medical and flying grading tests, then whilst you are at Sandhurst you will be eligible to be selected as a helicopter officer pilot. Over the next two years, you will learn to fly the Juno (H135) training helicopter. You will also learn about communications, navigation and tactics. At the end you will be awarded the Army Pilot Badge (your "Wings") and get streamed onto your operational aircraft, usually the Apache (and attack helicopter) or Wildcat (used for reconnaissance). You will then complete your conversion course (approximately 18 months) before arriving fully qualified at your front line regiment. You'll earn £26,504 during your year of training at the Royal Military Academy, Sandhurst, before commissioning and becoming a Second Lieutenant, on £31,857 a year. As your experience increases, pilots become eligible for recruiting and retention payments on top of their basic salary. Once your online application has been approved, you'll have an interview with a recruiter, who will talk to you about the corps that you would like to join. You'll have the chance to learn more about your chosen corps, although you won't make your final decision until you're in training at Sandhurst.